Learn how Envision has shaped and improved the processes of the companies in our case studies. Envision is the leader in field-based construction delivery solutions, connecting project leaders with real-time insights and providing unmatched daily project visibility. Envision gives you earned versus planned progress in one place, immediately. That’s really exciting. I also know everybody is looking at the same information, not slightly different approaches by each engineer on each roster. The consistency of the front end, which our client looks at, is the real benefit. We can also start to mitigate delays faster because of the ability to log events. If you find out about an issue four days late, you’re four days behind solving it. With Envision, our team can grab their phones, take a photo and you get notified almost instantaneously. The greatest value is the electronic timesheet system. A supervisor would sign 30 to 50 dockets of a morning and electronic timesheets takes that off the table. This takes a task that doesn’t require any planning away from the supervisor so they can really plan the day and deliver information to their teams that’s relevant and front-of-mind…not diluted by timesheets. That planning time is priceless for understanding the job and from a safety and quality perspective. no doubt around validity. At a top level, progress is not normally measured so minutely. Envision, through its rules of credit, has a much more robust and defensible position on the progress you’ve earned, rather than basing it more on a rule of thumb. There’s [also] a great benefit in having the detail to separate intended tasks from unplanned events. By identifying and including these events in your schedule, you have the opportunity to manage issues effectively. When you have the right information in the right place, you get control and can really manage a project. Envision has supported an ongoing continuous learning mentality. We’re not just running by gut feel. It’s a disciplined and professional approach to dealing with project issues. Without Envision, we would have less data-based decision-making and control. It also means success isn’t ad hoc. Envision bridges that gap. It has encouraged a uniform, consistent approach…bringing everyone to the same high standard. With electronic timesheets, you can reliably use the data the day after it’s entered. We’re also now providing information to the workforce, so data flows down as well as up. That means a greater sense of ownership and more discipline and awareness. We now really have everyone working toward the team getting better, and Envision ties that together. Envision opens up different communication, reporting and decision-making avenues for people like construction managers, project managers and engineers. It’s a lot easier for them to see how well they are performing and whether they need to up their game. That wouldn’t have been available in the past without days or weeks of analysis – and by then, the information would be outdated. With Envision, as long as your data is current, you have a snapshot in seconds of where you sit as a project. Envision provides a central source for all project data, which is handy and much better than spreadsheets. It also streamlines the creation of weekly reports – a real area of value. Every day we have team members feeding information in, right across our project. Because it is widely used, it gives you a true central repository of data. Envision has provided accurate real-time reporting that has enabled fast and effective decision making that has led to measurable improvements in efficiency and productivity which has lead to cost and schedule benefits on our project. This is the greatest access we’ve had to real-time, accurate performance information to enable quality, value-adding decision-making. We’ve seen significant, measurable improvements in efficiency and productivity, which has led to cost and schedule benefits on our project. A strong management decision to support the use of a single point of truth being Envision has created a stable data set, helping to promote a ‘best for project’ culture. The project team could make fast and supportable decisions to exploit the opportunities a ‘production line’ approach with the adoption using lean construction techniques. 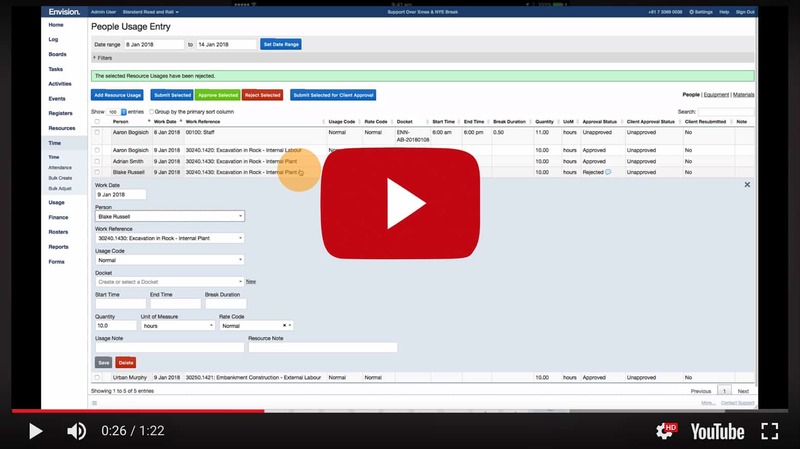 Envision replaces uncontrolled spreadsheets and disconnected IT systems with a single, consolidated view of project work. Using Envision creates transparency and ensures that project risks are identified and addressed in close to real-time. I feel that Envision empowers me with a great sense of ownership and control over my work compared to any other system I’ve used previously. My timesheets are completed faster, my work budgets and progress are easier to review and it’s much easier to manage any unplanned work using events. The user interface is very simple to use and it takes no time at all to enter my data, allowing me to get on with the job. I’ve found Envision to be easier to use and collaborate with payroll and roster coordinators than anything I’ve ever used before. I felt a little overwhelmed when introduced to the new system, but Envision quickly proved to be very intuitive, efficient for getting my site’s timesheets completed on time and does so much more than any other system of its kind that I’ve experienced before. I’m particularly fond of Envision’s iPhone attendance app because it makes capturing and tracking attendance so simple! Envision was implemented by our site at the Bechtel Caval Ridge CPP Project and now the QCLNG Project for QGC. It worked excellently on tracking man hours and progress on site. Made our man hour forecasting and budget reviews much easier to track. As with any software, if you input the data accurately, you get the right outcome. Envision is a user friendly and highly customisable tool for managing my data and meeting the reporting expectations of both management and the client. With all of the Project’s data in one place, getting the information I need, when I need it, is made very easy. I also find that the collaborative interaction with the schedule is vastly improved with Envision by making it more accessible and readable to everyone in the team, whether it be the supervisors, engineers or managers. It disseminates vital project information amongst the users and integrated data sources, thereby making it a simple task for the contractor and its subcontractors to manage their individual scopes of work as well as their interfacing with others. Practically every other project I have worked on in the past has relied heavily on managing their data and reporting with spread sheets. In comparison, Envision is way ahead of its time in terms of intelligent and innovative data management and project reporting. Not in my 20 years of construction experience have I ever had such an insight into my projects from a remote location, Envision provides a real time ‘window’ in from anywhere in the world…Envision has really brought our program from paper to life by making it a real part of the daily planning process…Supervisors and engineers are now able to get accurate reporting on productivity that can then be assessed and rationalised where possible. The site team now have a tool that easily records events that affect the project, which are then escalated real time to managers allowing prompt decisions to be made that can mitigate time and cost effects. Envision has been the first tool that has truly allowed us to be able to comply with the short time frames in construction contracts with regards to escalating notices…often on the same day as the event happening! This affords the client the opportunity to mitigate if possible or contribute to a solution almost in real time…Envision is the only software system that offers this sort of data collaboration, there simply isn’t anything else on the market that is able to offer the same features. Envision introduces the structures and disciplines required to effectively manage a project to achieve the best possible outcome. Envision allows projects to significantly reduce the amount of under claims they would have to carry to due to its event and productivity management ability. This allows projects to earn their profit in ‘real-time’. It would be negligent of us as a company not introduce Envision on our projects.